Seasonal allergies, which is commonly referred to as hay fever, is very common amongst children and adults. In America, 1 in 5 people has allergies. If one parent has allergies, there’s a 25% chance the child will too. When both parents have allergies, the child’s chances increase to 60-70%!! While it may feel like you’re sick, an allergy is actually your body’s immune system overreacting. 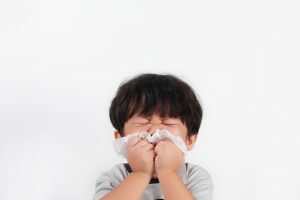 I definitely recommend visiting your Pediatrician to determine if your child is suffering from allergies and if so, what course of action is most appropriate for your little sneezer. The good news is that we have a lot of options for treating seasonal allergies. There are multiple over the counter medications to help with many common symptoms. If your child only has eye symptoms, then allergy eye drops might be helpful. If he or she suffers nasal symptoms, then an inhaled nasal spray might be just right. For some, a prescription medication regimen may be necessary to alleviate more severe symptoms. If you would like to find out what allergens trigger your child’s worst symptoms, you may be surprised to learn that many pediatric offices and allergists offer allergy skin testing. This is a great way to find out specifically which trees, pollens, molds, grasses, animals, etc may be his or her worst allergy triggers. With this knowledge, you will be better equipped to avoid these triggers before they wreak havoc on your little one. Once allergy symptoms are under control your children will stop sniffling and sneezing, and start to feel better. Once they feel better everyone will be a little bit happier.